What an interesting group of pioneers December brings us. Some were well-known in the Western District while others toiled quietly to build their lives. Obituaries come from a chemist, a cricketer, a former Portland Mayor, a pastoralist, a Monsignor, mothers and two pioneers of the newspaper industry in Western Victoria. James TRANGMAR: Died 16 December 1888 at Portland. James Trangmar was a resident and a former Mayor of Portland, but he acquired land throughout the Western District. Headstone of James Trangmar & family. North Portland Cemetery. William NICHOLAS: Died 17 December 1890 at Colac. Arriving in the Colac area around 1841, William Nicholas was an early pioneer of the district. He came first to shear for three local squatters, then he worked in the forests before purchasing a bullock wagon. He carted produce to Geelong and Ballarat, returning with stores. His obituary, by Mr B.N. Butcher of Colac, was written with emotion. John HARRIES: Died 18 December 1914 at Stawell. John Harries was born in Carmarthenshire, Wales in 1843 and arrived in Stawell in 1875. A true Welshmen, he was a great singer and was a member of the Presbyterian church choir and Prouts Band of Ballarat. He married and had eight children. His brother, Reverend David Harries had joined him Australia, but he had passed away a few years earlier. Ann WALTON: Died 31 December 1914 at Mount Arapiles. Ann Walton is one of my favourite pioneers and I am familiar with her as she was the mother-in-law of Jonathan Harman Jnr and mother in-law to the nephews of the Oliver sisters that married Harman brothers. Also, I know the area around Natimuk and Mount Arapiles in the Wimmera where she and her husband James Keyte pioneered and it can be harsh country. Ann, born in Scotland, arrived in Portland aboard the Indian Ocean in 1854 as a four-year-old. Her parents, David Walton and Margaret Tennant went to Mount Gambier and that is where she married James Keyte. James and Ann selected land in the Natimuk district in 1872 and remained until 1892 when the bought land in New South Wales. She later returned to Mount Arapiles when her health began to fail. Oliver YOUNGMAN: Died 17 December 1915 at Port Fairy. Oliver was born in Norwich, England in 1847 and arrived at Port Fairy with his parents in 1849. His father, Arthur Youngman was an owner of the Port Fairy Gazette and later the Alpine Observer at Bright and Oliver was involved with both newspapers. He was the ledger keeper for grazier Sir William Clarke for twenty-nine years and later his for his son Sir Rupert Clarke. Oliver held high office in the Methodist Church and was a member for fifty years. Leaving a daughter to mourn him, he was buried at the Port Fairy Cemetery. Catherine COWAN: Died 14 December 1916 at Ararat. Catherine Cowan was born in Scotland and arrived in Australia with her parents around 1853. She was married Alexander McKenzie at Trawalla Station near Beaufort where Alexander was manager. They spent time at De Cameron Station near St Arnaud before settling at Ararat. Catherine and Alexander had nine children. Florence GILLIES: Died 16 December 1917 at Ararat. lorence was born in Scotland and arrived in Victoria aboard the Lady Peel as a sixteen-year-old in 1853. She married John Dow at Skipton before they took up land at Tatyoon under the Duffy Land Act of 1862. After John died, Florence lived at the Burrumbeep homestead, before moving into Ararat. Alfred Bussell CLEMES: Died 26 December 1917 at Stawell. Born in Cornwall, Alfred Clemes trained as a chemist in Bristol before travelling to Victoria in 1852. He opened a business in Melbourne until 1854 when he and his wife opened businesses at the various goldfields. They arrived in Stawell in 1858 where he remained. He became Shire secretary in 1870 and held the role for forty-four years, only retiring four years before his death. He was a co-founder of the Stawell Hospital and the Mechanics Institute. Bernard CONLAN: Died12 December 1918 at Dixie. Bernard Conlan, born in County Down, Ireland, should have bought himself a lottery ticket after a twist of fate saved him from death from a cauldron of molten iron at the Clyde shipyards in Scotland and he survived a bout of typhoid fever on the voyage to Australia, despite given little chance of survival. He worked first in South Australia before moving to Victoria, living at Garvoc and Wangoom before buying land at Dixie, near Warrnambool. 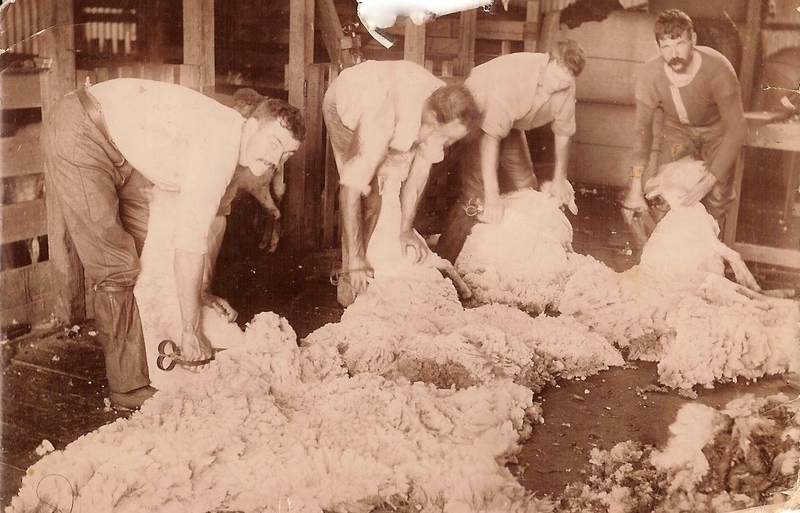 Despite being burnt out in bushfires in 1887 and losing much of his stock during drought time, with Bernard’s hard work and perseverance he raised a family that had much respect for him. John THORNTON: Died 16 December 1919 at Mount Myrtoon. And so begins the obituary of Yorkshire born, John Thornton. At age eighteen, with his brother, he left England aboard the Great Britain for Melbourne. He spent time in Gippsland before buying land at Mount Myrtoon, where he lived for the next fifty years. He also opened a stock and station agents that he built into a successful business with transactions from Hamilton to Geelong. John was a talented cricketer and represented Victoria in 1859 and 1860 and made a great contribution to the Camperdown Cricket Club. James Park Dawson LAURIE: Died 2 December 1928 at Naracoorte, South Australia. James Laurie was a son of Reverend Alexander Laurie and was born at Kongatong station, near Warrnambool, in 1846, After his schooling, mostly at Portland, he pursued his journalistic aspirations and started the Mount Gambier newspaper The Border Watch, along with his brother Andrew Frederick Laurie. In 1868, he travelled to America and Europe and on his return, having sold his share in the newspaper, he moved into pastoral pursuits. In 1870, he was elected to the South Australian House of Assembly. He married Dora Kean, daughter of Thomas Kean, in 1882 at Portland. James Kean, Dora’s brother, established the Portland Mirror. Right Reverend Monsignor Michael Joseph SHANAHAN: Died 6 December 1931 at Hamilton. Monsignor Shanahan was well-known among the Roman Catholic community in the Western District. Ordained in his home country, Ireland in 1864 he then travelled to Melbourne. He took up the parish at Carisbrook and later the Inglewood parish overseeing churches in towns such as Clunes, Creswick and Talbot. In 1878, he became assistant pastor at Warrnambool, then parish priest at Hamilton in 1886 and was there for the completion of the St Mary’s Church. In 1916, he was appointed Dean of Ballarat. During his time in Hamilton, Monsignor Shanahan was president of the hospital for twenty-two years. Money raised and presented to him went towards completing the well-known spire of Hamilton’s St Marys Church. Louisa SEALEY: Died 4 December 1934 at Casterton. Louisa Sealey was born around 1861 and arrived in Casterton with her parents when it consisted of only two houses. She married John Black and they lived in Miller Street, Casterton. After her husband’s death, she resided with her son on his soldier settlement property at Nangeela. Another son, Gordon was killed at Passchendaele, France during WW1. Four sons and four daughters survived at the time of Louisa’s death and she still had eight surviving siblings. Thomas PHILIP: Died December 1937 at Hamilton. Thomas Philip was born in Scotland and came to Victoria as a child after his father, Captain John Philip, gave up the high seas and took over Lagoon Station near Cavendish. John then purchased Miga Lake Station and St Mary’s Lake Station, which his sons, trading as Philip Bros. ran after his death. Thomas married Margaret Laidlaw in 1883 and they had one son and three daughters. Thomas died at his home Kenmure in Ballarat Road, Hamilton. Kenmure is one of my favourite homes in Hamilton and one that I went past almost daily for around fifteen years. It has recently been sold and is now, probably for a short time only, on a Hamilton Real Estate agent’s site, with some great photos too. Mary Ann JOHNSTONE: Died 22 December 1951 at Portland. Mary Ann was born in Portland around 1856, the daughter of James Johnstone and Dorothy Hall. Her brother was John Johnstone and her sister-in-law, Mrs Hannah Johnstone. Mary Ann married Mark Kerr in 1876 and they resided at Drik Drik before moving to Swan Lake about twenty-five kilometres away. Mary Ann was considered an excellent horsewoman, equal to any man.